Bitter and sweet. Definitely. When I started reading this novel, I looked for the Panama Hotel in Seattle on Google Maps - and there it was. I checked out the tea room on Yelp. What a heart-touching remembrance this novel is, of times gone by and the destruction of an entire ethnic neighborhood. Amidst the fears of war, people lost their homes and their lives were shattered. This author picked up pieces to craft his tender story of a very young Chinese boy falling in love with a Japanese girl at a time when the two countries were at war. War never leaves without destruction, and sometimes it doesn't take bombs to decimate peaceful homes, leaving them vacant for others to take advantage of. This novel explores the dynamics of multiple cultures meeting and melding, to an extent, in one city's residential area. The locations are still there, but what of the people who went before? The novel traverses time, sometimes exploring 1942, and at other times, the 1980's. The characters are vivid and their painful emotions are universally understood. I like that the author wrote the story of the circumstances surrounding the existence of the Panama Hotel... a place we can now visit to remind ourselves of the history of Seattle during World War II. 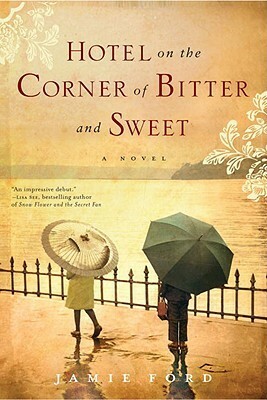 Sign into Goodreads to see if any of your friends have read Hotel on the Corner of Bitter and Sweet.